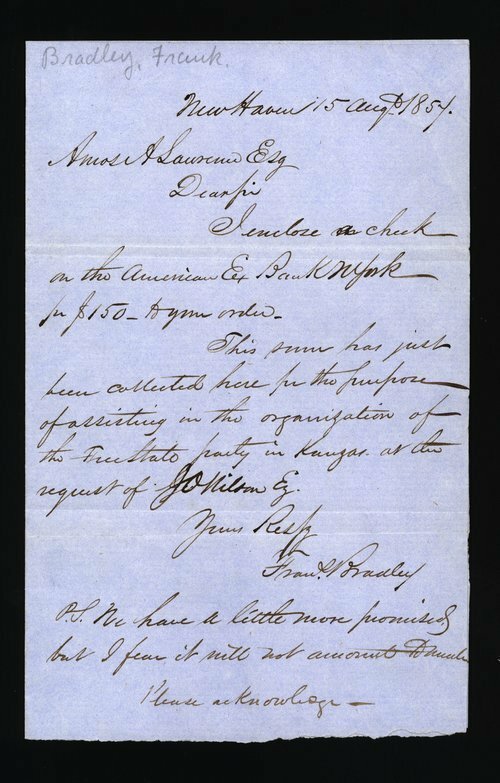 The following is a letter from Frank Bradley in New Haven, Connecticut, to Amos Lawrence regarding a check for $150 that Bradley sent to support the organization of the Free State party in Kansas. Antislavery New Englanders often supplied money and resources in order to encourage the Free State settlement of Kansas Territory. The free-state town of Lawrence, in fact, was named after Amos Lawrence. A searchable, full-text version of this letter is available by clicking "Text Version" below.